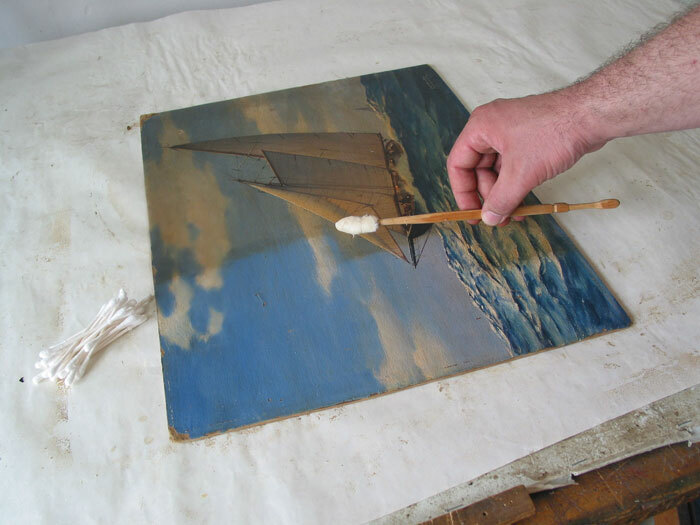 Whether you are looking to maximize the profit of an investment or simply ensuring a beloved heirloom will last another generation, Art Restoration by William diMarco can help. We provide museum quality painting restorations executed with meticulous care and the personalized attention that comes with a small business. With nearly a decade of previous experience working as the head conservator for the oldest art gallery in Philadelphia, William can provide you with the comfort of knowing that your artwork is in the hands of a heavily experienced and knowledgeable professional who has successfully completed thousands of restorations with a combined value in the hundreds of millions of dollars. 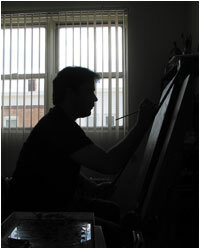 Some of the more notable artists he has worked on include: Peter Paul Rubens, Thomas Eakins, NC Wyeth, Norman Rockwell, Childe Hassam, James Everett Stuart, James Buttersworth, Albert Bierstadt, Herman Herzog, Edward Redfield, Daniel Garber, and George W. Sotter, along with all of the Pennsylvania Impressionists, Thomas Cole, Asher B. Durand and a majority of the Hudson River Valley painters and many more. Name an important American traditionalist painter and chances are he's restored their work. 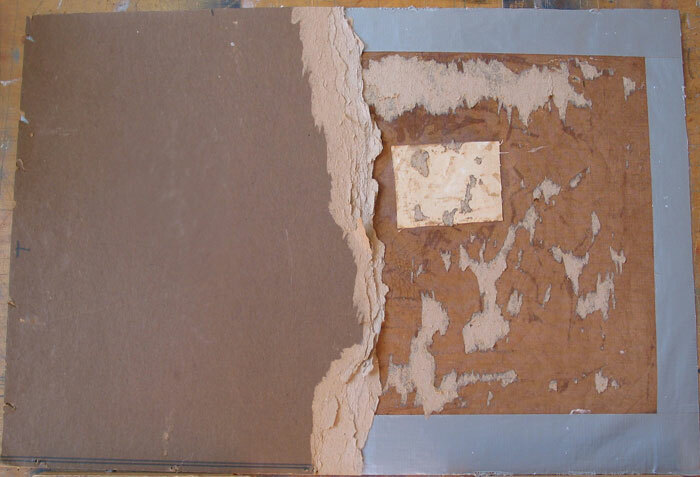 All materials used in the process are archival to promote the longevity of the artwork. All methods used are reversible, safety and minimal intervention is paramount prior to any procedure enactment. Photo and written documentation for insurance claims are available upon request. Local pick up and delivery are available to make your experience as convenient as possible. Shipping service is also provided to clients not within driving distance. To begin the process simply call 215.964.7354 or send an email to get a free estimate. A final quote can only be given upon visual inspection of the artwork. Pricing is determined through several factors. Please have the size of the piece, the name of the artist and brief description of the damage available when you contact the studio. Read some testimonials from clients. 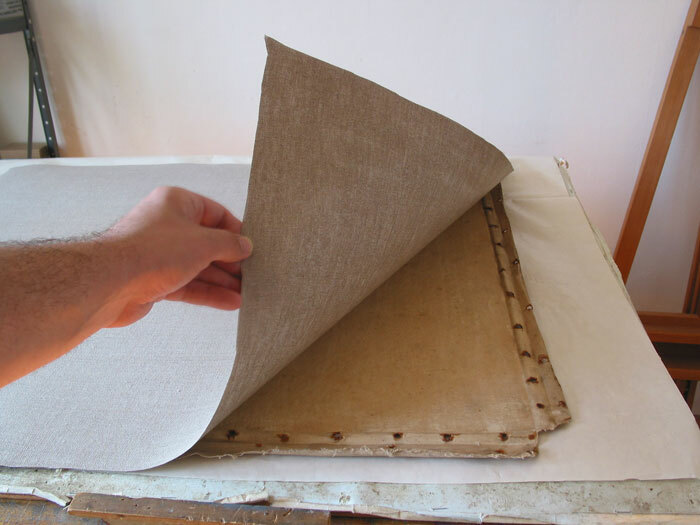 "I presented William diMarco with a treasured oleograph that was badly torn with a soiled surface. He invisibly repaired the tears, reinforced the object from behind, and cleaned the surface back to its original brilliance. 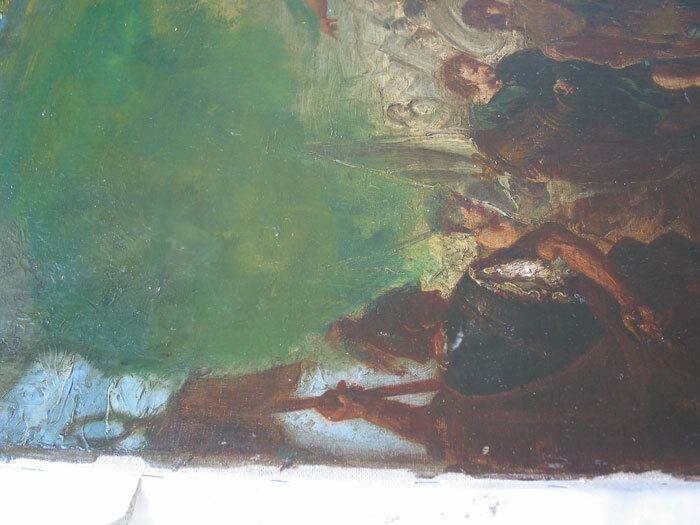 There is no alteration of the image with inpainting or other forms of intrusive restoration. The final product is clear, with the images unretouhced, and the tears invisible. It now hangs over my library fireplace." "The Philadelphia Society of Free Letts called William diMarco to restore two paintings by the same artist for an upcoming anniversary. He did a very good job lining the damaged paintings, and really brightened up the original colors that had apparently become dingy and darker, especially when compared to another work by the same artist, which didn't get refurbished. He was always on time, professional and had our order done within a few weeks. Thank you William, we will definately be calling you again for other paintings!" I recently received an heirloom nineteenth century oil portrait as a wedding gift, which had suffered for decades of exposure to the elements in a relative's barnafter being torn through. Searching the internet for a local, Philadelphia restorer, I found diMarco Restoration and engaged William to repair the tear, reline and clean the portrait. I was so thrilled with the result. The portrait now has a place of prominence in my home. Indeed, the transformation was so good, and the price so reasonable, that shortly thereafter I engaged William again to clean another oil painting (a nineteenth century still life) which had yellowed varnish and tobacco staining blurring the terrific detail I suspected was hiding underneath. Once again, William exceeded expectations and returned the painting to its original detail and grandeur. I encourage anyone seeking restorations to engage diMarco Restoration as I very much look forward to doing business with William again. DiMarco Restoration has my highest recommendation. Having William as a resource is important to me as a collector of early California impressionist artworks. He is both knowledgable and talented. William has worked on several pieces for me, including a canvas tear repair, cleaning and varnish, relining, and repair to paint loss on two important pre- 1945 California impressionist pieces. I recommend William with confidence. After checking out the work of a number of restorers, I felt that Will was the best that I could find. If you examine his work, you will see that I was not disappointed. I am a repeat customer and will hire William again. William's service is first rate... my art was expertly restored and delivered when promised. William provided "before and after" digital images and returned my art in secure hand made crates. I have no reservations about recommending William. Please click on a link to see examples.